The commander of the shuttle Atlantis says his crew is "elated" with the progress of their mission to the International Space Station, including two complex-but-successful spacewalks and the problem-free attachment of a new Russian module. In an interview with CBS News early Thursday, Ham said he was especially pleased with the "Rassvet" module's docking by shuttle astronaut Garrett Reisman, operating the space station's robot arm, because of the complexities inherent in the task. "As you remember from our conversation a few weeks ago, as I went through all of the intricacies of the operation that had to happen to get MRM (mini-research module) docked and talking to space station, I started scaring myself talking to you!" Ham joked. "Making sure that happened (Tuesday) with the crew, everybody working together, everyone on the ground, it turned out to be absolutely fantastic. We were elated. "The spacewalk we did yesterday was another difficult spacewalk and the boys outside performed flawlessly and got us well ahead of our timeline. Everybody on board here last night, as well as our ground team, we had a nice conference with them yesterday evening, we were all absolutely thrilled with how this mission is going so far. So we're just going to stay focused and get through the next few days and hopefully call this one a good one." Reisman and Michael Good plan to stage a third spacewalk Friday to install a final two solar array batteries and to retrieve a robot arm grapple fixture from the shuttle's cargo bay that will be installed later on the Russian Zarya module. The spacewalkers also will carry out a variety of more minor get-ahead tasks before returning to the Quest airlock module. 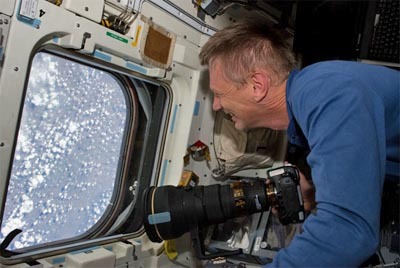 Piers Sellers will operate the station's arm during the spacewalk from inside the new multi-window cupola on the Earth-facing side of the Tranquility module. A robotic work station was moved into the cupola before Atlantis' launch and this is the first assembly mission in which arm operators have had a direct line of sight to the space crane. Sellers said the new arrangement is a major improvement over the indirect television views arm operators had to settle for before the cupola arrived. "Tracy and I have been sitting in this little glass bubble that hangs underneath the space station and you can see everything," he said. "You can see big chunks of station, you can see the shuttle docked to one end and the arm stretched out in front of you and it makes it so much easier to figure out what's going on with the arm, which is like a big, monstrous crane. You can actually see what it's doing and go and grab things with it. Much better than watching it all on TV, I can tell you." Reisman used the arm Tuesday to attach the Rassvet module. The new compartment was opened up early Thursday, but the station crew does not plan to begin unloading the 1.5-tons of NASA equipment and supplies that are stored inside until after Atlantis departs. "Our Russian crewmates have just opened up the hatch and looked inside," Caldwell Dyson said. "I went back to get an update and it sounds like it's full of stuff, not the least of which is hardware that must be removed before they can actually get to all of the goods they're to bring out. So I think there's a little bit of work to be done before we can go in and start enjoying it and utilizing it for the laboratory it's intended to be. "But it's a great addition to the space station, especially for our Russian segment," she said. "I think we can look forward to some relief in terms of stowage as well as some extra space to do the very valuable experiments we've brought on board." Caldwell Dyson, a shuttle veteran, was launched to the space station last month from the Baikonur Cosmodrome in Kazakhstan aboard a Russian Soyuz capsule. She took a moment Thursday to describe the experience. "Launching on a Soyuz is a bit different from launching on the shuttle, not the least of which is the environment you're in," she said. "Having launched on a shuttle, being in Florida and surrounded by all that is familiar, to launch and live in Baikonur for two weeks, and also leave your home in Houston and family and friends months prior to that, really makes the mission start a lot earlier than the moment the rocket lights. "I can tell you the Soyuz itself is a very robust vehicle, and it's very interesting, the differences between a solid rocket like the shuttle launches with and the liquid engines of a Soyuz rocket. And the fact that the Soyuz actually hangs on its launch pad rather than (is) bolted to it also creates an interesting sensation the moment of liftoff. There's a lot more yawing involved in the launch as well as more Gs being pulled. "Life on board the Soyuz is, of course, different than shuttle," she said. "You have much more cozy quarters, but much fewer people to share that with. I could go on and on. The differences are very unique and very curious as well. But suffice it to say it is a vehicle I felt very safe in, and a ride that I'll never forget. "Living on board the space station, I was warned by those who have come before me and spent many months on station that it takes about three weeks to actually kind of feel your legs aren't under you any more and to start actually utilizing this place for what it is, a floating laboratory. "But it's not until about the six-week period that I'm reaching now that you actually feel like you've got a handle on the place. I do feel a lot more skilled at moving around this very large ship than I did when I first got here, of course, and I'm in awe every day of what our countries have accomplished and feel very privileged being here." The final planned flight of space shuttle Atlantis is symbolized in the official embroidered crew patch for STS-132. Available in our store!